Sustainable designer Benjamin Jones combined his love of bicycles and green living and created a community composter that is not just environmentally friendly, but fun to boot! Funded by grants from PlayHarvest, the park allows visitors to cycle their way to fresh organic fertilizer. Located in the Red Gate Community Garden, the sustainably sourced composter is part playground, part machine, and all fun. The bike composter, with a decorative wood head of a hobby horse, is helping teach the residents of Bedford-Stuyvesant about green living. 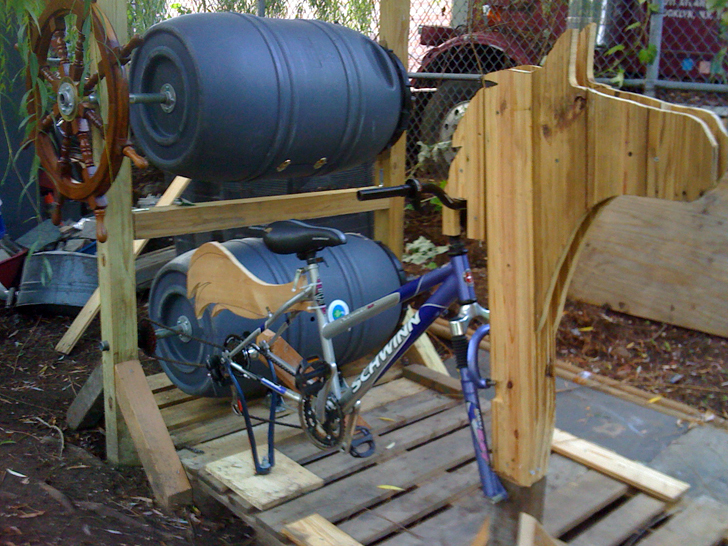 Jones constructed the composter from materials from Build It Green, attaching the gears of a Schwinn bike to two composting barrels. Neighborhood residents can bring their table scraps, leaves, and expired perishables to be spun round and round in the barrels. In lieu of working out at a gym, several local residents take on the task of peddling the bike to get all the composting juices flowing. Spinning the barrels lets all of the scraps inside to decompose evenly, creating rich fertilizer that can be spread across Red Gate’s abundantly lush garden. Along with the Fresh & Fit Garden Project, the bicycle composter illustrates local activist’s goals: to encourage eco-consciousness and healthy living through exercise and nutrition. Jones’ composter touches all of the goals, enabling an exercise machine that yields a component to grow a healthy garden full of fresh foods. The food scraps can then be composted, creating a healthful cycle for the neighborhood to adopt and be inspired by.